Approximately 2766 miles west of the spot where General John Reynolds was KIA on July 1, 1863, the Civil War installation named Camp Reynolds in his honor nearly burned to the ground last week. 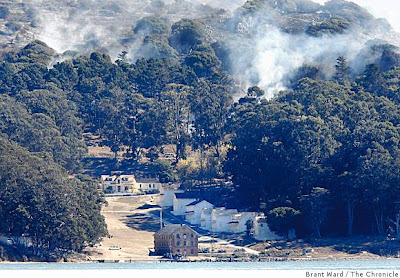 A wildfire on Angel Island in San Francisco Bay came within 100 yards of the Civil War buildings, but firefighters were able to save Camp Reynolds and all 120 historic structures on the island. Angel Island, inhabited for 1,000s of years, has a recorded history back to the visit of the first Spanish warship, the San Carlos, in August of 1775. It was fortified during the Civil War to guard against Confederate raiders, was a processing point for soldiers in both World Wars, served as the "Ellis Island of the West" for 60 years, and hosted a Nike missile base in the Cold War era. "The grass will grow back, but the Civil War barracks? They won't grow back," said Todd Lando, spokesman for the Marin County Fire Department, which led the fire response. "It was just a very good thing that we managed to save them. It's where we focused most of our attention Sunday night." Half of the oaks, pines, manzanita and brush that until Sunday covered most of the island like a green cloak are gone—400 of the area's 740 acres are burned flat, Lando said. 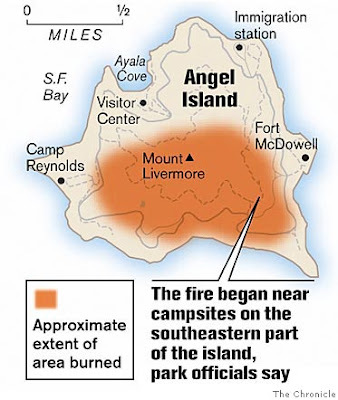 Most noticeably, Mount Livermore—the island's highest point at 788 feet—has been stripped of its leafy crown and stands bald and ashy." 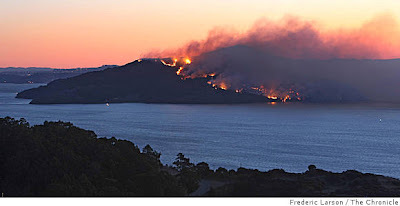 The (Frederic Larson) photo at top shows the fire as seen from Marin County. The map, and the (Brant Ward) photo below show the extent of the fire, and how close it came to the Civil War buildings at Camp Reynolds. Close one! 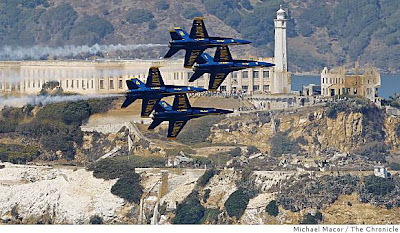 While we're on the subject of islands on San Francisco Bay, I couldn't resist sharing this stunning (Michael Macor) photo from the recent Fleet Week 2008 festivities, showing the Blue Angels against an Alcatraz backdrop (part of Angel Island is visible the background). The Civil War defenses on Alcatraz island, first discussed in this blog entry would not have fared well against today's naval assets. "We have nothing in common with you people down south. Nothing," said Randy Bashaw, manager of the Jefferson State Forest Products lumber mill in the Trinity County hamlet of Hayfork. "The sooner we're done with all you people, the better." 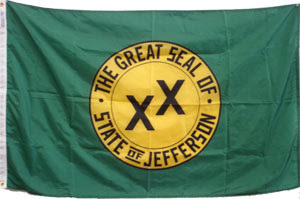 A movement for the upper tier of counties in California, along with the southernmost part of Oregon, to secede and form the State of Jefferson, first gained steam in 1941 but was pushed out of the news by the attack on Pearl Harbor. It's not an idea that has entirely gone away, however, as the articles at this web site attest. The people of this sparsely populated region feel ignored by Sacramento and Salem, though surprisingly the people of Yreka (pronounced Why-reeka), the "cradle of secession" in this part of the country, live closer to the state capital of California than do 2/3rds of the rest of the state's citizenry. And this even though Yreka is close to the border of Oregon. Many people do not appreciate the sheer length of the Golden State. At it's most distant points, it is 770 miles long (with 840 miles of coastline). That's farther than the distance from Chicago to Atlanta. 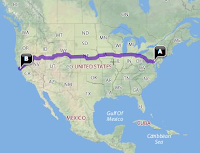 Even though San Francisco is 400 miles north of Los Angeles, there is still over 300 miles of country above San Francisco before one hits the Oregon line. I'm sure the secessionists are right to feel forgotten in the halls of power, but democratic power is (in theory) determined by votes, and the votes are in the population centers. San Diego is 500 miles from Sacramento, but it's also one of the largest cities in America. Secessionists in the antebellum era could see the writing on the wall. The same principle was at work. For most of the life of the Union up to the Civil War, the political power of the slave states kept pace, even dominated the three branches of the federal government. But the shift was steady and inevitable. In 1860, only one of the nation's ten largest cities, New Orleans (168,675), was in a slave state, and its population was just a fraction of that of New York (813,669) and Philadelphia (565,529). In 1859, on the eve of the war, there were 237 seats in Congress (following the admission of Oregon). If I've done my math right, counting the border states of MO, KY, DE, and MD., slave states were able to muster 90 Congressmen before the admission of Kansas, versus 147 Congressmen from free soil states. With the vast territories of the West lining up for statehood, and northern population expanding exponentially—and spilling out into the West—it's not hard to understand why southern states with a common overriding interest, slavery, decided to start the game over with a new Congress all their own. Alas, the good people of the State of Jefferson don't have much in the way of armories, mints, or shipyards to seize, nor do they have a Robert E. Lee. So they're going to have to do this the hard way, through legislation. And that brings us back to the problem of votes, something else they don't have enough of. Brian Downey over at Behind AotW has put together one of the most interesting campaign-related blog entries I've ever read. 146 years to the day after the historical events, a lucky group of us tracked the unlucky 118th Pennsylvania Volunteers to the places and views of the Battle of Shepherdstown Ford (20 September 1862). Under the capable guidance of Dr Tom Clemens and members of the Shepherdstown Battlefield Preservation Association (SBPA), we waded the Potomac, scaled the heights, and walked the field. Most interesting are descriptions of the river bottom (rocky, not muddy, with stretches of smooth, wagon-friendly slabs of stone). Twelve years ago, the Civil War Forum folks at CompuServe held their inaugural annual gathering at Antietam, with Tom Clemens as our guide. He's as good as they get. If Tom can be imposed upon to reprise this river crossing, I'll be on board for that one. In your visit to Behind AotW, be sure to visit the SBPA site (linked to in the paragraph above).